If the current Republican tax reform package passes, Apple could be able to return more than $100 billion of cash to its shareholders next year. However, the tax reform bill currently being considered by Congress would dramatically change the U.S. tax code for corporations. If it passes, it would enable Apple to repatriate a huge amount of cash -- and return most of it to shareholders. Let's take a look at just how much money could become available. Many experts believe that the United States' statutory corporate tax rate of 35% is too high. For one thing, it encourages corporations (including Apple) to find various loopholes to reduce their tax liabilities. It also has induced some companies to relocate to lower-tax countries, leading to a loss of high-paying jobs in the U.S.
Apple keeps most of its cash overseas to reduce its tax burden. Image source: Apple. This doesn't mean that Apple will be able to return $222 billion to shareholders anytime soon. That's because Apple has issued an enormous amount of debt over the past few years, in order to pay for its buybacks and dividends without repatriating any of its overseas cash. By the end of 2017, Apple is likely to have even more cash available. 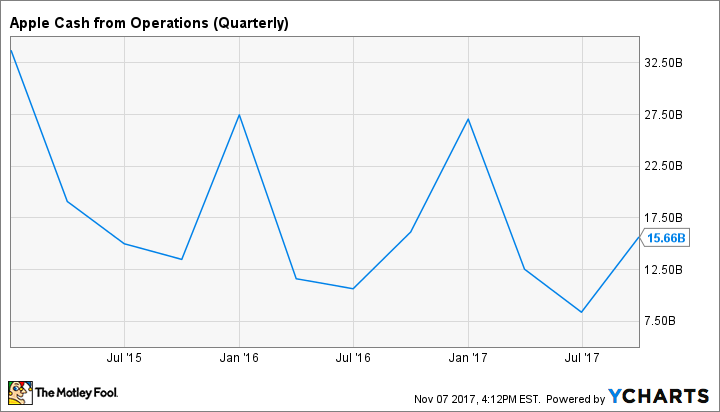 In each of the past two years, it has generated more than $27 billion of cash from operations during the fall quarter. In 2014 -- i.e., during the strong iPhone 6 product cycle -- cash from operations reached $33 billion in the same period. Based on Apple's guidance for a record-setting first quarter, it is likely to add tens of billions of dollars to its cash and investments this quarter. Apple Cash from Operations (Quarterly), data by YCharts. This is arguably too much to return through share buybacks in a short period of time. (That's especially true because Apple will be churning out more cash than ever on an annual basis under the proposed new tax code.) However, Apple could pay a $15-$20 special dividend to get its excess cash into shareholders' hands in a speedy manner. That would be a nice windfall for its investors -- and would leave the company with a rock-solid balance sheet.